Shown above (front, l-r): Matt Mcdevitt, Finn Kelly, Aidan Ellis; 2nd row, Shay Meaney, Austin Kelly, David George, Sean Olsen; 3rd row, James Fitzgerald, Nick Berardinelli, Aidan Prendergast; 4th row, -Nick Ferrara, Douglas George, Luke O'Sullivan, Dominic Piscopo. Coaches: Shaun O'Sullivan, Pat Kelly, Chris Berardinelli, Ken Prendergast, Phil Olsen. Dorchester’s dominance in this year’s Mayor’s Cup hockey tournament speaks volumes about the commitment of the men and women who volunteer to teach our kids in the Dorchester Youth Hockey program. Our neighborhood was represented in all eight divisional final games last Sunday — and six teams skated home with citywide cups. That’s phenomenal. Mike Devlin, who has coordinated the Mayor’s Cup tourney since 2000, said it was “very unusual” to have the same neighborhood represented in every divisional final. There were six other city neighborhoods in the mix, along with the SCORE Boston program, which is doing good work in introducing kids of color to the sport. In all there were 50 teams, approximately 80 games, and roughly 1,000 players all over the city who participated in the 20th annual tournament. 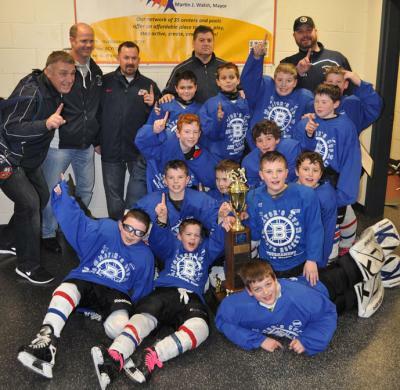 Devlin said that Dorchester Youth Hockey’s team of dedicated volunteer coordinators and coaches – all of them volunteers – have really excelled in making the Neponset-based youth program the city’s best. The coaches for DYH deserve particular praise for sacrificing time away from their families for practices and training. Some do not even have kids in the league, says Broderick. “We’re very proud of the base, the fundamentals we give these kids, and especially for a bunch of guys who only played youth hockey, maybe some high school ourselves” said Broderick. Meanwhile, two Dorchester Youth Hockey alum are taking our neighborhood’s proud name national. The Hayes brothers, Jimmy and Kevin, are both products of the youth league and alums of Boston College and its championship-caliber program. On New Year’s Eve, the brothers met for the first time in professional competition as Kevin’s New York Rangers played Jimmy’s Florida Panthers. 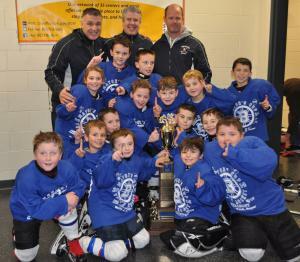 The Rangers prevailed, 5-2, but the brothers both played well, with Jimmy scoring a goal. In an article penned by fellow Dorchester native Dan Ryan that ran in the Boston Herald last week, the brothers both gave shouts to their parents and hometown. Next Thursday evening, Kevin will play his first game as a Ranger on the TD Garden ice against the Bruins. You can bet that Dorchester will be well represented in the arena that night.